We're sorry, this tour is now full. But don't worry, we have plenty of experiences waiting for you to join us on! Ken Duncan is Australia’s favourite (and probably most famous) photographer! Recognised internationally as a gifted and prolific landscape photographer, Ken still chooses to describe himself as “… an average photographer, with a great God – merely an interpreter of God’s creation”. He’s well known as the pioneer of Limited Edition Photographic Art in Australia, paving the way for photography to be recognised as an art form in this country. The increasing number of Australian photographers now emulating his panoramic style and finding a market for their work is testimony to Ken’s success. Ken is deeply committed to researching and developing the latest and best technology to bring photographic art into homes and offices right around the world. With every new release, he delights long-time collectors and new fans alike with his own inimitable style of landscape photography. Each new exhibition is more vivid and stunning than the last. Always striving for excellence, he travels extensively throughout the world in search of the stunning panoramic landscapes – or Panographs – for which he is best known. 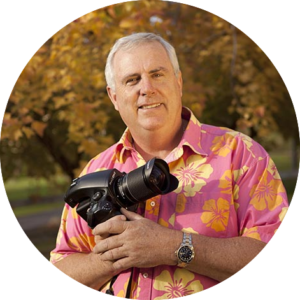 He has received a multitude of awards – nationally and internationally – including a Medal of The Order of Australia (OAM) for his services to landscape photography, publishing and the arts. Although Ken prefers the panoramic format because “that’s the way we see”, he is well versed in a multitude of formats and media. He has even dabbled in cinematography and would like to do more with this medium in the future. He can turn his hand to any type of photography – from portraits to landscapes to 3-D and everything in between – and produce consistently creative results. Ken Duncan’s basic philosophy is best summed up by these words of truth from the Bible. “For since the creation of the world God’s invisible qualities – His eternal power and divine nature – have been clearly seen, being understood from what has been made, so that men are without excuse.” (Romans 1:20). On arrival at Queen Alia Airport in Amman we will be met by our representative who will assist the group with visa on arrival, immigration and baggage formalities. We will thendepart Amman Airport and freshen up at our Dead Sea hotel. Some may choose to rest this afternoon, but most will quickly regroup for our visit to Jerash, Roman ruins that give us a great insight into the typical design of Roman cities 2000 years ago. Enjoy an early night back at the hotel. This morning we will visit Bethany beyond the Jordan. This site is regarded as the place where John the Baptist baptised Jesus in the Jordan River. We then travel south along the Kings highway towards Petra. Along the way we will stop at the town of Madaba, to see an impressive floor mosaic map of Jerusalem which is considered the oldest surviving cartographic depiction of the Holy Land. Check in to our hotel in Petra and enjoy some free time before visiting the UNESCO World Heritage Listed Petra site for the evening light show. Sunrise at Petra followed by a full morning exploring yet another World Heritage site, including the “Siq”, El Khazneh, The Treasury, Kings Tombs & more. Share the excitement and sense of achievement of Swiss explorer Johann Ludwig Burckhardt who executed an adventurous, dangerous but inspiring project which resulted in the rediscovery of this lost city in 1812. Take time to find the more remote high parts of Petra such as the Monastery [Ad Deir] or High Places or return to the hotel for brunch. In the afternoon travel from Petra to the Allenby Bridge border crossing into Israel and continue to Bethlehem. The morning will start with a sunrise photography session overlooking Bethlehem. We will also visit the Church of the Nativity and enjoy the global depictions of “Mother and Child” as well as special access (TBC) to the Chapel of the Innocence. We then travel to Nazareth to visit the Church of Annunciation and Mary’s Well, where it is believe that the angel Gabriel appeared to Mary. After this, visit an operational re-enactment of life in a Nazareth Village, a depiction of real life in Jesus day. We stop at the Mount of the Precipice for a photo stop before continuing to Tiberias, on the shores of the Sea of Galilee. The remainder of the day is free for exploring the tourist town of Tiberias. Shabbat (the Jewish Sabbath) starts at sunset: take in this cultural experience by observing locals. A pre-dawn start with a photographic session on top of Mt Arbel with a spectacular view over the Sea of Galilee. Return to the hotel for breakfast before visiting some of the well-known biblical towns and sites scattered around the lake. To start we view the 2000 year old “Jesus boat” and then sail across the Sea of Galilee before stopping at Ein Gev-a Kibbutz restaurant for St Peter’s fish lunch. The afternoon will be spent walking through historical Capernaum, the main base of Jesus when in Galilee and we will visit St Peter’s church on the beach where Jesus stood in Luke 5 & John 21, “cast your net on the right side…153 fish…” Stand where the multiplication of loaves and fishes occurred at Tabgha before a quiet reflection opportunity at the Mount of Beatitudes, [Sermon on the Mount Matt 5: 1-8]. Lastly of all visit Magdala, the home town of Mary Magdalene. Sunset on the shores of the Sea of Galilee for another photographic session. Farewell the Galilee region and appreciate the roof top panoramic views of the Jezreel valley from Mt Carmel where Elijah had a showdown with the prophets of Baal before exploring King Herrod’s Roman Theatre, Hippodrome and more at the old Roman port of Caesarea. We then travel to the port city of Jaffa, also known as Joppa, on the outskirts of Tel Aviv. Wander through the cobblestoned alley ways and check out the old port. Continue to Jerusalem for a 5-night stay. This morning we will photograph sunrise at the Mount of Olives. We will then walk through the Kidron Valley along the Eastern side of the Old City, a place of olive groves and ancient tombs. It was a path often trodden by Jesus himself on his village to the village of Bethany. We will continue to the Garden of Gethsemane and the Church of All Nations, as well as the house of Caiaphas the high priest where Jesus was denied by Peter and was held the night before his crucifixion. We then walk along the Via Dolorosa from the Ecce Homo Arches along the stations of the cross, culminating at the Church of the Holy Sepulchre. This morning we will visit the Upper Room, where Jesus attended the last Supper and returned for Pentecost. Enjoy a picnic breakfast on site. Spend some free time in the Old City – perhaps visit the Cardo, the Southern Steps, wander through the alleyways and shops or walk the World Heritage listed Ramparts of Jerusalem from Jaffa Gate to New Gate. We will meet at the end of the day to travel to a location for a sunset photo shoot. Today enjoy a desert day trip out of Jerusalem to the oldest inhabited city, Jericho. Take the cable car up to the Mount of Temptation for a spectacular view. We then continue to the Dead Sea for lunch (not included) and a float in the Dead Sea. On our way back to Jerusalem we stop at Wadi Qelt lookout for another photographic opportunity of the Judean desert. This morning we return to the Old City for a sunrise photographic session at the Temple Mount. Continue to the Western wall where bar Mitzvahs are celebrated. The afternoon is free. You could consider visiting Yad Vashem and the Israel Museum in New Jerusalem or visit the Yehuda markets. On arrival you will be met and assisted with immigration procedures. Meet your Egyptologist and begin with a visit to Old Coptic Cairo, visiting the Khan El Kalili Bazaar, the largest in the Middle East. Abu Serga Church and the Hanging church (no photographs inside). Our sunset photo shoot will be at El-Moez Street – Qalaoun Mosque followed by the Sound and light Show at the pyramids. Sunrise at Giza – with a group of 10-15 camels available for the photo shoot. Return to the hotel for breakfast and time to relax. Sunset photo shoot will be at the Citadel or Old Cairo near Azhar Park. 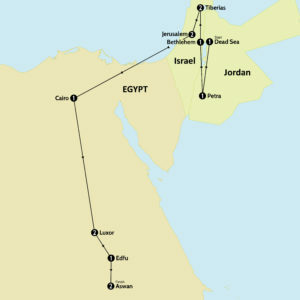 Check out of our Cairo hotel and transfer to the airport for our domestic flight to Luxor. Check onto the charter boat and settle in. This afternoon we will visit the East Bank of Luxor, including the Karnak Temple and sunset at the Luxor Temple. Our sunrise photo shoot will be over the West Bank. There is an option to take a hot air balloon ride (USD$175). We then visit the Valley of the Kings (3 tombs), Temple of Queen Hatschepsut & Colossi of Memnon. Lunch on board as we sail to Esna to visit the Temple of Khnum then sail to Edfu. Breakfast on board the boat followed by a visit to Horus Temple. Sail on to Kom Ombo and visit the temple there before sailing on to Aswan. Our sunrise photo shoot will be on the Nile at Aswan. We will have 2-3 felucca’s available for the shoot. Breakfast on board before a visit to the High Dam, the unfinished Obelisk and Philae temple (by boat). The afternoon is free or you can do an OPTIONAL trip to Abu Simbel. Enjoy our last night on the boat. Disembark from our boat and travel to Aswan airport for the flight back to Cairo with connecting flights home to Australia. Selah is holding a group booking with Emirates departing from Melbourne & Sydney. If you would prefer to travel from another Australian city, we can request this with the airline. Note the internal flight from Tel Aviv to Cairo has a 20kg luggage allowance. Travellers with Qantas frequent flyer memberships are also welcome to nominate this for points. Travel extension requests must be received in writing no later than Friday 26 April 2019. Australian passport holders DO NOT require a visa for travel to Israel. The visa for Jordan is included in the tour price (Australian passport holders). A visa IS required for Egypt & can be applied for online. We will supply you with the relevant information for you at the time of booking. Your passport is required to be valid 6 months after your return date. You should bring mostly wide angle lenses, and a tripod. There will not be much call for really long lenses on this tour, so probably 200mm is the longest lens anyone would need. A cable release or remote shutter is useful for low light photography at sunrise and sunset. Ken will also recommend people bring a torch (preferably a head torch so hands are free) so they don’t stumble in the dark on the way to a sunrise location. Torches can also be useful for astro (night time) photography, which we might attempt if we have time. The balance of payment is due 90 days prior to departure which is on or before Friday 31 May 2019 . An invoice will be forwarded to you prior to this date. Payments made by Credit cards incur fees (1.5% for Visa/Mastercard & 3.5% for American Express). Direct deposits into our bank account & cheques are welcome.